CarGurus has 51,412 nationwide Tacoma listings starting at $3,200. Toyota's Tacoma has enjoyed a long reign as king of midsize pickups, but with increased competition, the Tacoma's been redesigned for 2016. Its changes should enable it to maintain a lead, for now. 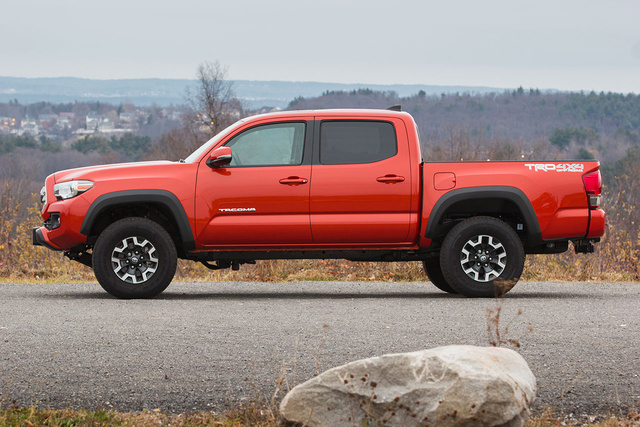 The Toyota Tacoma is the longtime leader in midsize pickups. The 2016 version can be configured 29 different ways, with two cab styles. There’s the extended Access Cab or the 4-door Double Cab, each available with rear-wheel or 4-wheel drive. For years, the Tacoma has been a go-to pickup for off-roaders, outdoor enthusiasts, and professionals who need a truck without the bulk of a full-sizer. The Tacoma’s capability, reliability, and predictability have built one of the most solid pickup reputations out there. For 2016, the Tacoma is all-new. It’s been re-styled inside and out, and the aggressive sheet metal looks great. The design team took inspiration from desert racing and gave the new Tacoma boldly flared wheel arches, a taller hood with purposeful creases, and a new tailgate that incorporates an integrated spoiler for improved aerodynamics. Configured as a Tacoma TRD Off-Road like the one I drove, this is an aggressive-looking truck packing a high level of thoughtful refinement from its composite bed to its well-thought-out interior. It’s a lot quieter inside, too, thanks to an acoustic windshield, upgraded seals, and sound-absorbing headlining and floor padding. New features include projection-beam headlamps with LED daytime running lights, a locking tailgate with a soft-opening feature, and plenty of available premium features. Some high points include Qi wireless charging, climate control, touchscreen audio, push-button start, and blind-spot monitoring with rear cross-traffic alerts. The TRD Off-Road trim includes extra skidplates, Bilstein suspension dampers, and a suspension tuned to shine off-road, thanks to a 35-year history of racing. There’s a lot of choice in Tacoma-ville. The standard Access Cab versions have extra room behind the front seats compared to other midsize pickups. Access Cabs pair up with a 73.7-inch bed and ride on a 127.8-inch wheelbase. Double Cabs have 4 conventional doors and a spacious 60/40 split second row. There are two wheelbases and bed lengths for Double Cab models: a 127.4-inch wheelbase with a 60.5-inch bed, or a longer 141-inch wheelbase that accommodates the 73.7-inch bed. Either way, you can choose rear-wheel-drive (RWD) or 4-wheel-drive (4WD) configurations. On top of the comprehensive nuts and bolts of wheelbases, powertrains, and bed lengths, the Tacoma is available in five trim levels. The lineup starts with the hard-working SR and continues to the well-equipped SR5, TRD Sport, TRD Off-Road, and the range-topping Limited. SRs and SR5s feature fabric-trimmed seats, and all Tacomas have standard 4-way front seats. Both TRD versions have unique upholstery, while the Limited gets premium leather. Entune audio is standard for the SR, while SR5s feature Entune Audio Plus with enhanced infotainment, including a 6.1-inch touchscreen, the Scout GPS Link navigation app, and more. Entune Premium Audio is standard for the TRD Tacomas and features deep smartphone integration for a data-enhanced experience. Navigation is part of Entune Premium Audio’s offerings, along with an App Suite and 7-inch touchscreen. Tacoma Limited models carry the Entune Premium JBL Audio system as standard equipment. 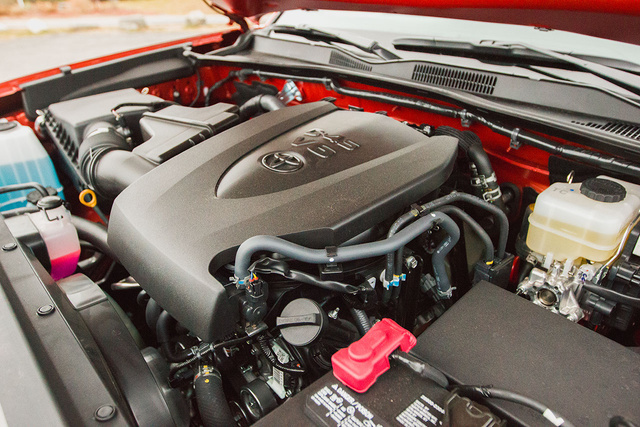 The 2016 Tacoma introduces a new 3.5-liter V6 engine that’s more powerful and efficient, a 6-speed automatic transmission, and increased use of high-strength steel throughout both the body and the frame. The suspension has been tuned for a better on-pavement ride with more off-road capability. Engines are a carried-over 2.7-liter 4-cylinder, producing 159 hp and 180 lb-ft of torque, and the new 3.5-liter V6, which makes 278 hp, a gain of 42 hp compared to the 4.0-liter V6 it replaces. Torque for the V6 comes in at 265 lb-ft. It’s the first Atkinson-cycle engine in the segment, an efficiency strategy made possible thanks to VVT-iW (Variable Valve Timing with Intelligent Wider Intake) and D-4S direct and port fuel-injection technology. Either engine can be paired with a new 6-speed automatic transmission. Manual transmissions are a 5-speed for the 4-cylinder and a 6-speed for the V6. The Tacoma TRD 4WD Off-Road I drove had the 3.5-liter V6 and 6-speed automatic. It’s a smoother, more-efficient engine, and that’s reflected in its fuel-economy rating of 18 mpg city/23 highway in this trim. The 6-speed automatic feels like it’s been plucked directly from Lexus. It’s silky and well-matched to the engine. RWD is standard, with a locking differential. For trucks that head off-road, the holy trinity is gearing, ground clearance, and approach, breakover, and departure angles. The Tacoma TRD Off-Road uses a 3.909:1 final drive ratio and features a 2-speed transfer case with a 1.00:1 high ratio and a 2.57:1 low. Ground clearance is a generous 9.4 inches, and this model’s got angles of 32/23.1/21 degrees respectively for approach, departure, and breakover. In some limited off-roading, the TRD Off-Road suspension proved plenty for confident climbs and descents. The adjustable crawl-control system automatically keeps speeds limited when picking your way along in 4-Low. It uses the ABS hardware and works like a charm, and it has settings for different terrain types. Multi-terrain Select filters driver inputs and adjusts the power delivery to suit the type of surface you’re crossing. Be it loose gravel, snow and ice, or mud, the Tacoma can be set to behave the right way, so you'll get where you’re going. Out on the road, the Tacoma TRD Off-Road is tight and tidy. The rack-and-pinion steering is accurate, and the new engine acquits itself well. Although it’s more powerful, peak torque hasn’t changed. In fact, it’s moved up to 4,600 rpm from the previous engine’s peak at 4,000 rpm. While I never felt like the Tacoma lacked power, I found I needed to keep digging my spurs in on the highway to keep up with traffic. Your best bet is to set the cruise control, because the physics of shoving a tall 4x4 through the air leads to frequent transmission kickdowns and the need for attentive throttle minding, which make the driving experience a bit less smooth than it could be. Ultimately, highway commuting is not the mission of this Tacoma, and it acquits itself well otherwise. Even with Kevlar-reinforced Goodyear Wrangler tires on its handsome 16-inch alloy wheels, the ride wasn’t punishing, and grip felt more than adequate. The Bilstein dampers and off-road-tuned suspension are more at home off the pavement, with a cloud-like ride that smoothes out rocks, dirt, and gravel with impressive grace. Off highways and out of the woods, the new seals and extra interior sound absorption do their part to keep out the racket, while the chassis and powertrain exhibit good manners. The rear end isn’t prone to skating through corners, and the steering is accurate. The brakes are equally precise. From behind the wheel, the Tacoma feels as it always has. Even though it’s grown significantly from its days as a truly compact pickup, it’s still tidy. The seating position is rather low, and even with all its newfound refinement, there’s still enough brawny truck sound and fury. It’s a lot more pleasant to drive than before, and the new V6 engine does deliver better fuel economy. It’s also stronger than before for towing. A Tacoma with the V6 and towing package is rated to tow up to 6,800 pounds, which is 300 more than before. For V6 models, the towing package includes a Class IV receiver hitch, transmission cooler, 4- and 7-pin trailer wiring connectors, and trailer-sway control integrated into the stability control system. A Double Cab Tacoma is a true family vehicle. With 4 conventional doors and a generously sized rear seat, it has plenty of usable interior space. Access Cabs have it harder, with rear seats best suited to only occasional use. Long-trip comfort may have you wishing you’d taken a sedan. The low seats lead to some strange leg positions and angles, though they’re good in terms of comfort and support. Some front-seat occupants may find that the head restraints push uncomfortably on the backs of their heads. There’s a huge center-console storage bin, well-thought-out storage areas, and thoughtful details. Check out the hidden storage under the bottom cushion of the back seat or the clever pockets to tuck the rear seatbelt buckles into when you’ve got the cushion tilted. The cabin is newly redesigned, and while it’s still a clean layout, some controls may be harder to use. The small knobs and strange display orientation of the climate-control system may be hard to adjust with gloves on or view at a glance. The materials have a high-quality appearance, including the uniquely patterned cloth upholstery and stitching unique to this TRD trim. The Tacoma is outfitted to encourage use of its truck capabilities. The bed, formed from a tough composite, can stand up to lots of abuse. A built-in tie-down system with sliding cleats makes it easy to secure your cargo, and Toyota offers options for bike racks, cargo dividers, and other accessories that work directly with the bed rails. A built-in power inverter is available, putting a 400-watt AC outlet into the bed, as well. The new Tacoma carries more tech than ever before, but it’s not pushing the state of the art. There’s standard Bluetooth hands-free integration and audio streaming, Siri® Eyes Free, touchscreen controls, and voice recognition, but no WiFi hotspot capability. 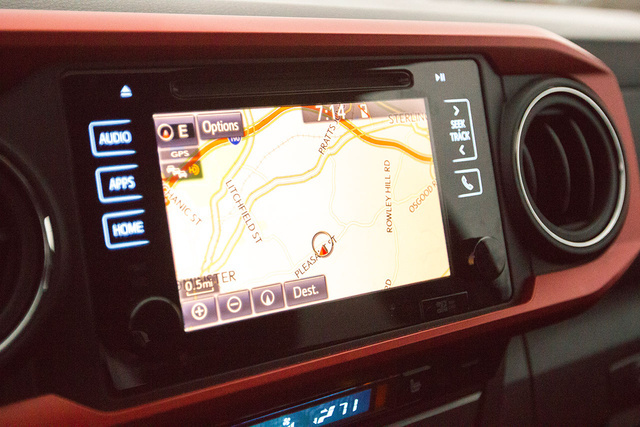 The optional Entune™ premium systems include navigation and an App Suite for more functionality. The App Suite uses the cellular data connection from a paired phone, and included apps are Slacker, iHeart Radio, Pandora, Yelp, Facebook Places, and Open Table. Other apps provide information, such as Stocks, Weather, Traffic, Sports, and Fuel Prices. The jury is out on how useful all these apps actually are. The ones that got the most use during the test drive were the entertainment apps like Pandora. After all, stocks, sports, and weather information are easily found on the plain old radio. The navigation system is easy to use and mature. The system doesn’t have any real buttons, though, which can make it hard to use. Several times I swiped an on-screen button while using one of the knobs. The shiny surface of the screen can be affected by glare and shows lots of fingerprints. The Qi wireless charging pad is a new feature that will be convenient for drivers with compatible phones, but the most important tech features are driver aids like blind-spot monitoring, a rear-view camera, and rear cross-traffic alerts. Since it’s a new model, safety scores and crash-test ratings for the 2016 Toyota Tacoma aren’t yet available. The 2015 model was rated Good by the Insurance Institute for Highway Safety for most tests, though it received a Marginal score for roof strength. 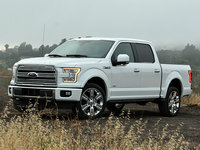 The body shell of the new truck uses ultra-high-strength steel, though that’s mostly for weight reduction. Pickups, by their very nature, are more prone to rollovers than sedans, and usually need more distance for panic stops. All-terrain tires trade some grip on pavement for traction off road. These are considerations for any pickup buyer, and they’re natural traits of this type of vehicle. Among its peers, the Tacoma’s precise handling and midsize dimensions make it easy to control, even in emergencies. The Tacoma also carries the Toyota Star Safety System™, which includes vehicle stability control, traction control, an antilock braking system, electronic brakeforce distribution, brake assist, and Smart Stop brake-override technology. The airbag system includes driver and passenger knee airbags, roll-sensing side curtain airbags, and active headrests for the front seats to minimize whiplash injuries. The Tacoma’s available 4WD enhancements, such as Multi-terrain Select and Crawl Control, will help you avoid spending the night stuck in the wilderness. The Tacoma has loyal owners and legions of fans. Its resale value is high, and its reputation is excellent. Depending on how it’s equipped, the Tacoma can be more expensive than other midsize pickups. 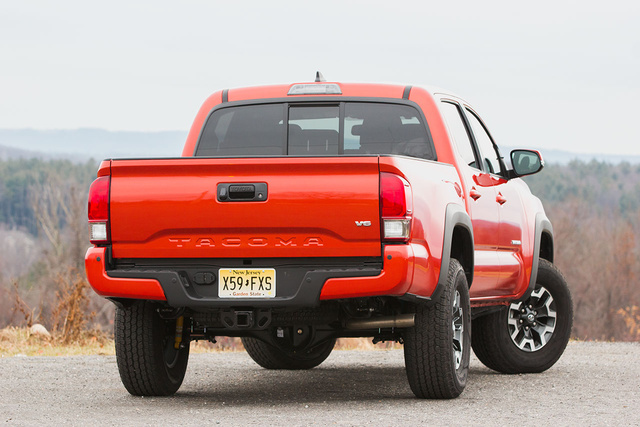 Tacoma base prices range from $23,300 all the way up to $34,745. The Chevrolet Colorado, by contrast, starts at $20,995 and rises to $35,835. The Nissan Frontier leads with value, starting at $18,190 and topping out at $35,510. There’s a lot of overlap among the competition, but given the higher base price, a Tacoma can start you off already in the hole. The quality and durability of the Tacoma are reasons for its popularity, and you can expect it to hold its value better than any of its competitors. Efficiency with the 4-cylinder is 19 mpg city/23 highway/21 combined with RWD. A 4-cylinder 4WD returns 19/21 with the manual and 19/22 with the automatic. The new V6 demands no fuel-economy penalty, with ratings of 19/24 with RWD and 18/23 with 4WD. The ability to run in Atkinson cycle on the highway pays clear dividends, even as it’s the most powerful Tacoma engine ever. Observed fuel economy was an average of 19.5 mpg over a week that included a high amount of stop-and-go driving and idling time. It’s right in line with the city/highway numbers, so you should expect to meet the rated figures. A RWD Tacoma with the 4-cylinder and 5-speed manual should exhibit an exceptionally low need for maintenance. In the past, there have been rust issues with Tacoma bodies and frames that turned into large-scale recalls. The composite bed has solved one of the most common rust areas, and the frame has been thoroughly revised. The 4WD system will by its very nature require more maintenance as you put on the miles—it has twice as many drive axles, after all. For its class, the Tacoma isn’t likely to present its owners with unusual problems or unexpected major repairs. Toyota’s past efforts to repair unforeseen issues with the Tacoma should also provide peace of mind. Dan Roth is a Boston-based automotive journalist who’s been writing about cars for a decade. A parallel career as a video producer and creative professional helped open the door to car writing in 2006, when he started working with Autoblog on its long-running podcast and producing videos. Dan has been fascinated with cars his whole life, leading to a large collection of tools, a driveway that houses a broken Volvo, and many sketchbooks filled with designs for his own cars that will never get built. 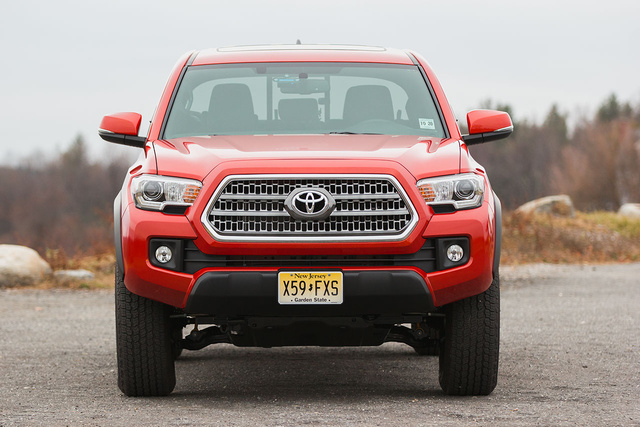 What's your take on the 2016 Toyota Tacoma? 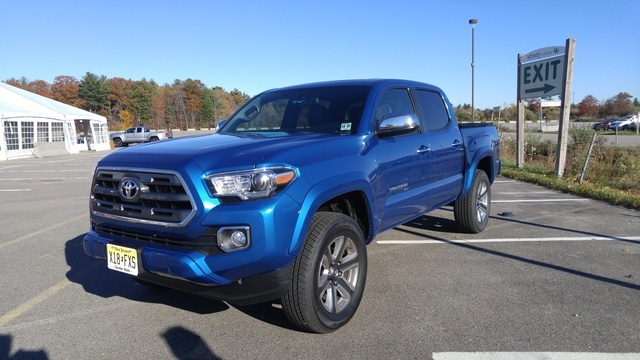 Arthor I have been reading a lot of reviews of the 2016 Tacoma, but I have not seen any that test drive review the performance of a 2016 Tacoma with the 2.7 liter, 4 cylinder. I read many arguments that suggest getting the 6 cylinder because it has more power and gets about the same mpg. When building a 2016 Tacoma, online, a 4 cylinder, work truck version, 4x4 is thousands less than the lowest priced build of a 6 cylinder 4x4 Tacoma. The difference in price can determine weather or not one can afford a Tacoma. Bottom Line: If the performance of the 4 cylinder is good enough, one could save thousands. If the performance of the 4 cylinder is inadequate, and one cannot afford the 6 cylinder, then the decision is made to look elsewhere, like the Chevy Colorado that has good performance even with the smaller engine. 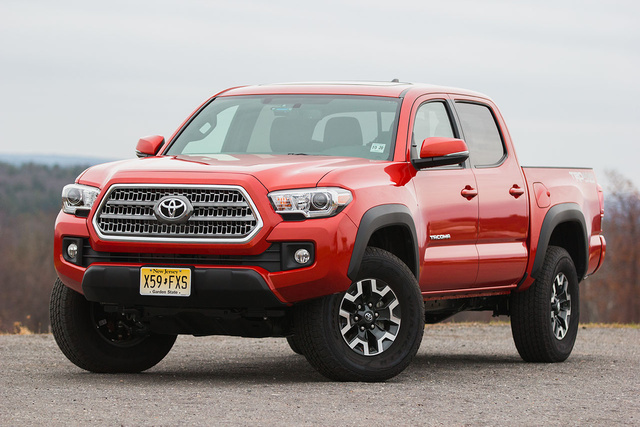 Users ranked 2016 Toyota Tacoma against other cars which they drove/owned. Each ranking was based on 9 categories. Here is the summary of top rankings. Have you driven a 2016 Toyota Tacoma? What Is Car Gurus Imv?